DUBAI, U.A.E, 28th May 2009 – Emirates airline announces a further expansion of its India operation as India propels itself to become one of the world’s fastest-growing aviation industries encouraged by a liberalization of its skies. The Dubai-based airline will add 22 weekly flights as a support for the Indian government’s ambitious growth plan to attract 100 million travellers in 2010. The existing service of 163 flights per week to 10 Indian gateways will be strengthened to 185 over the summer and winter periods. High demand routes - Ahmedabad, Chennai, Kolkata, Kozhikode and Thiruvananthapuram - will be the chief beneficiaries. Underlying Emirates’ continued investment in India, the airline’s expansion programme closely follows its ‘Journey through India’ campaign which involved a major revamp of the inflight product to meet regional preferences of India’s diverse populace. Majid Al Mualla, Emirates’ Vice President, Commercial Operations West Asia and Indian Ocean said: “The global slowdown is not over yet, but the outlook for the future is showing signs of improvement. When traditional European markets dried up, India was quick to refocus its trade and marketing efforts in targeting regions not severely affected by the economic downturn such as the Middle East, Eastern Europe, Africa and parts of Southeast Asia. Emirates has a robust global network spanning over 100 cities in more than 60 countries and is well-placed to connect India to the world. Emirates will serve Ahmedabad with a double-daily operation, adding six weekly flights to its existing eight-flights-a-week service. The expansion will be undertaken in a phased manner with three flights added on 2nd June and another three on 26th October. Pharmaceutical exports will receive a major impetus as the cargo capacity on the route will increase to 236 tonnes per week per direction. 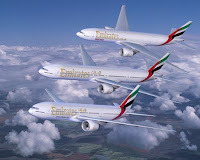 Emirates’ Chennai service will become a triple-daily with the addition of two flights between October and December this year, making Emirates the largest international carrier to operate from the city. Cargo exports from the city take the form of textiles, garments, electrical and electronic goods, machinery and spares, leather products, pharmaceuticals, perishables, valuables and mobile phones. The enhanced cargo capacity of 343 tonnes per week per direction will increase the city’s export potential to Europe, America, Africa and the Middle East. Kolkata is a key gateway for business and leisure travellers from the Middle East and Europe seeking easier passage to North-East India. Emirates will enhance connectivity to the city with five additional flights from 3rd December, bringing its total frequency to 12 per week. Export of fresh fruits, vegetables, jute, leather, silk and tea will benefit from an improved cargo capacity of 190 tonnes per week per direction. Kozhikode – a port city in the Indian state of Kerala – has been frequented by Middle East traders as early as the seventh century. The airline will further strengthen its Dubai - Kozhikode connection by adding five flights from 2nd December. Post expansion Emirates will operate 11 flights offering 157 tonnes of belly-cargo capacity per week per direction. Thiruvananthapuram is known for its beach resorts, famous backwaters, and close proximity to neighbouring hill-stations and world heritage sites. Emirates will boost its access to this tourist gateway with the introduction of four additional flights between October and December, bringing its total frequency to the city to 12 flights a week. With increases allocated to Kozhikode and Thiruvananthapuram, Emirates will serve the South Indian state of Kerala with 37 weekly flights, boosting the inbound tourism potential for the picturesque state.